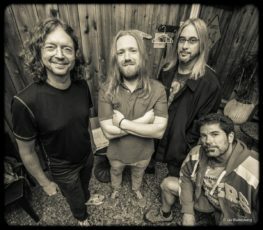 The Golden Gate Wingmen (Jeff Chimenti: keyboards, vocals; John Kadlecik: guitar, vocals; Jay Lane: drums, vocals; Reed Mathis: bass, vocals) play live on KPFA’s Dead To The World Wed. 4/11/18. Dead To The World airs from 8-10pm PT. The Wingmen will start just after 9pm. Thanks to Tony Ferro for the help with the live show!